Spacious Wooden Shoe Bench with Linen Upholstered Cushioned Seat, White and Gray. 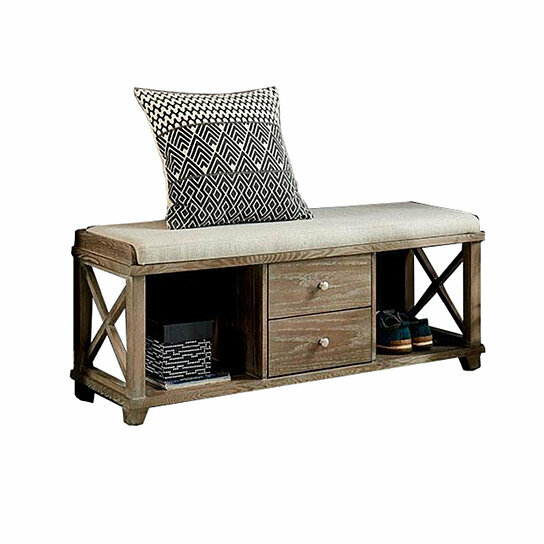 Bring this multi-functional large-size shoe bench to give a relaxed and contemporary style to your home interior. Made up of wood, this bench has gray fabric upholstered cushioned seat giving it an incredible look. This shoe bench features two drawers with knob pull at the center and two open shelf on sides give the most storage space possible. The ends of this bench has cross planked design giving it a beautiful look. Add this bench on entry way to create an enticing look. This bench can also be used in the sitting area as it can easily accommodate two to three people for sitting.